Paul Mauer was asked to summarize the moment. He didn’t hesitate. 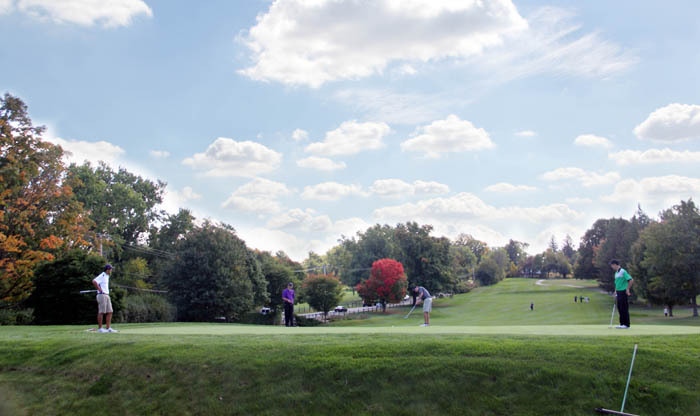 Looking at the results of Tuesday afternoon’s Catholic League golf championship at Glenside’s Lulu Country Club, Mauer’s emphatic words – and the joyful tone that accompanied them – made complete sense. With Mauer taking individual honors by shooting a Catholic League tournament personal best even-par 71, St. Joseph’s Prep snared the league title for the first time since 2010. The Hawks also severed rival La Salle’s three-year title streak. Earlier this season, the Hawks lost a nine-stroke decision in a head-to-head meeting with the Explorers. While the loss was disappointing at the time, Mauer sensed then that it could actually turn out to be a blessing in disguise. Each team was allowed eight participants, and six of them comprised the team total. After Mauer’s 71 came senior Nick Calabrese and sophomore Jack Mitchell with 75 apiece, and the trio of junior Mike Burns, junior Alex Butler and freshman Andrew Gallagher each scoring a solid 78, thus providing the Prep with a six-stroke victory over the next closest finisher — previously undefeated La Salle. The tournament’s key moment occurred in the par-four 11th hole. With player after player scuffling along with bogies, double bogies, triple bogies, etc., Mauer was the only golfer to break par. La Salle’s best player, senior Gary McCabe, struggled mightily, his nine strokes ruining what was actually an excellent all-around effort, his 76-stroke finish betraying how well he performed on the other 17 holes. But the game of golf is labeled with adjectives such as unforgiving and anxiety-provoking for a reason. Like Mauer, the aforementioned Calabrese didn’t have a lot of experience with the sport before becoming formidable. Both started playing competitively toward the end of eighth grade. Calabrese laughed when asked if there are some who are annoyed by his, by golf standards, quick ascension. 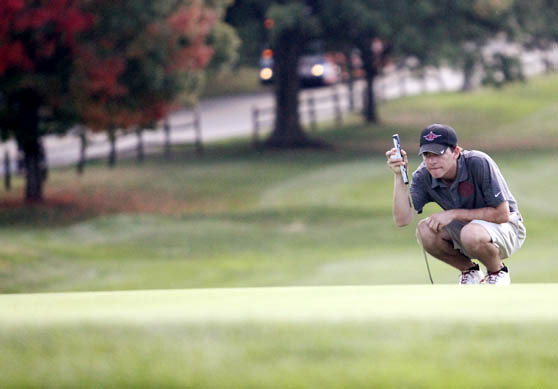 Because they kept checking out scores throughout the afternoon, several Hawks were aware that a championship was imminent once they discovered that Burns’ group had bested La Salle’s scores by eight strokes. Although it was not official, the smiles and tentative high fives commenced. During the post-tournament ceremony that officially dubbed St. Joseph’s Prep as the 2014 Catholic League champion, the Hawks were finally able to totally exhale. On that, all his teammates would agree. 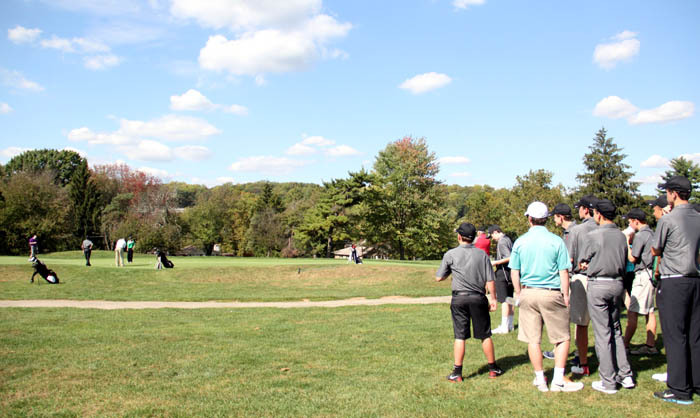 St Joseph’s Prep teammates watch as their last golfer finishes to win them the championship.